Join experienced creation teachers, including Dave and Mary Jo Nutting, and Discover Creation Training Institute students on this creation-based bus tour of Yellowstone National Park. Visit famous sites like Old Faithful, Artist Point, Mammoth Hot Springs, and other natural wonders. 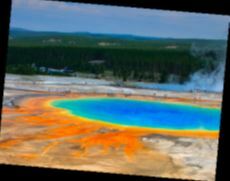 See geysers, hot pools, mud pots, geology, wildlife, and amazing scenery. Orientation, meals, lodging and additional creation teaching programs will be at Old Faithful Christian Ranch near Island Park, Idaho, west of Yellowstone. This Labor-Day Weekend Adventure includes dynamic presentations and on-site Yellowstone experiences to fortify you and your family to stand firmly on the truth of God’s Word. 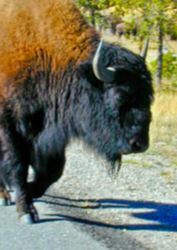 Be equipped to survive the evolutionary, naturalistic worldview philosophies that are so prevalent in our society today while you and your family thoroughly enjoy the famous Yellowstone scenery and features with experienced guides. Description: The tour begins on Friday with supper at Old Faithful Christian Ranch. An evening session will orient you to the field excursion and give you evidence for creation and major problems with the evolutionary theory. 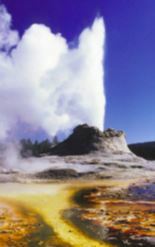 After breakfast, we will depart in the camp bus to Yellowstone National park and travel the southern loop to see many of the features Yellowstone is famous for: geysers, spectacular hot pools, beautiful scenery, geology, wildlife, and fascinating design features. There will be teaching at the sites and along the way in the bus. Expect some shorter (easy) hikes at various sites while some longer hikes are available if desired. The next day we will jump in the camp bus again to visit the northern loop of Yellowstone to see mud pots, Artist Point, Mammoth Hot Springs, and other fascinating features. We will once again return for dinner and lodging at Old Faithful Camp. Monday we will be at camp for creation presentations and fun family activities. After the Tuesday morning wrap-up and camp departure, an optional morning trip to Earthquake Lake is included. Others may choose to use this day to see amazing scenery at Teton National Park on their way to their next vacation destination. Accommodations: Old Faithful Christian Ranch is located near Island Park, Idaho and will accommodate families, groups, and individuals. Stay in rustic bunk cabins which have 10- 14 bunk beds. We will attempt to place large families in individual cabins when requested and if available. Otherwise you will save $25 per each adult/teen by utilizing separate men’s and lady’s bunkhouses. Although there are no baths in the bunkhouses, there are 2 sets of bath houses each with multiple sinks, modern toilets stalls, and showers. If you wish, you can reserve motel rooms in nearby Island Park and still take part in all of the tour, meals, and activities. Meals: The food is great! Three meals per day are provided, beginning Friday evening. The camp is excellent about accommodating special dietary restrictions, so please let us know in advance of any special needs. A love offering to the camp and to AOI is also greatly appreciated. Prices include 3 meals per day and lodging for 4 nights. Park entrance fee may be required. If so, it will likely be at a greatly reduced camp bus rate. Note: An Interagency LIFETIME (US Resident) Senior Pass for ages 62+ is good for all National Parks nationwide for life! * Lodging is in bunk-house type cabins. We will try to place families in their own separate cabins, but it may be necessary to place some individuals in men’s and lady’s cabins. Call us to confirm. For those who would prefer a motel for lodging rather than the camp’s rustic cabins, contact us. By phone: Please call 970-523-9943 or 1-800-377-1923. We suggest you download and fill out this form so you will have all information ready. You will also need current credit card information. Be fortified in your faith while having a real blast!